That's right, Godzilla fans, it's Rodan! As the powerful Pteranodon appeared in Ghidorah, the Three-Headed Monster. The excellently detailed vinyl figure measures about 24-inches wide x 15 3/4-inches tall! Originally a character separate from the Godzilla franchise, Rodan is a powerful Pteranodon that allies with Godzilla to save Monster Island and the world from monstrous threats. 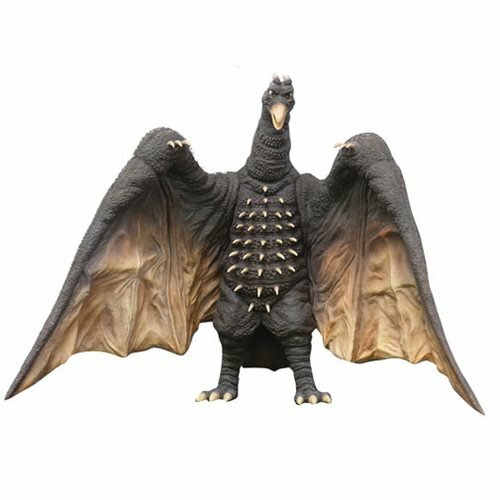 Here, this Godzilla Rodan 1964 Version Kaiju Vinyl Figure - Previews Exclusive recreates Rodan as he appeared in 1964's kaiju film Ghidorah, the Three-Headed Monster. In excellent detail, Rodan measures about 24-inches wide x 15 3/4-inches tall x 7-inches long!